When you read or hear about "Asian hornets," you need to keep two things in mind. First, the "Asian" moniker has been commonly applied to at least three hornet species native to various Asian regions. These include the Yellow-Legged Hornet, which is sometimes called the Yellow-Legged Asian Hornet (Vespa velutina); the Asian Giant Hornet (V. mandarinia) which is the world's largest hornet; and the Japanese Hornet which is a subspecies (V. mandarinia japonica). The second thing to remember is that none of these hornets have been found living in the U.S. in spite of what you may find posted online. However, this does not mean we shouldn't be vigilant. The yellow-legged hornet was discovered in France in 2004 and has spread into a number of other European countries. It was found in Great Britain's Channel Islands in 2016. It's a significant accidental introduction because this species, as well as the two other Asian species, behave as predators; they kill other insects and can wreak havoc on honey bee hives. If you suspect that you've run across one of the Asian species, contact your state's agricultural regulatory agency for instructions. Official positive identification requires preserved specimens. Frozen specimens are ideal if you can safely collect and freeze the suspects. Photographs cannot provide official positive identifications of a non-native Asian hornet; however, they can still be very useful. I always recommend snapping some pictures and sending them to the appropriate entomology experts in your state. I'd be happy to take a look at them if you're in Ohio. The two insects most commonly mistaken for Asian hornets are European hornets (V. crabro) and our native cicada killer wasps (Sphecius speciosus). Cicada killers are the largest native wasp found in Ohio. Their activity usually starts winding down at this point in the season; however, both the wasps and their robust namesake food item, dog-day cicadas (Tibicen spp. ; family Cicadidae), remain in full-swing in southwest Ohio. 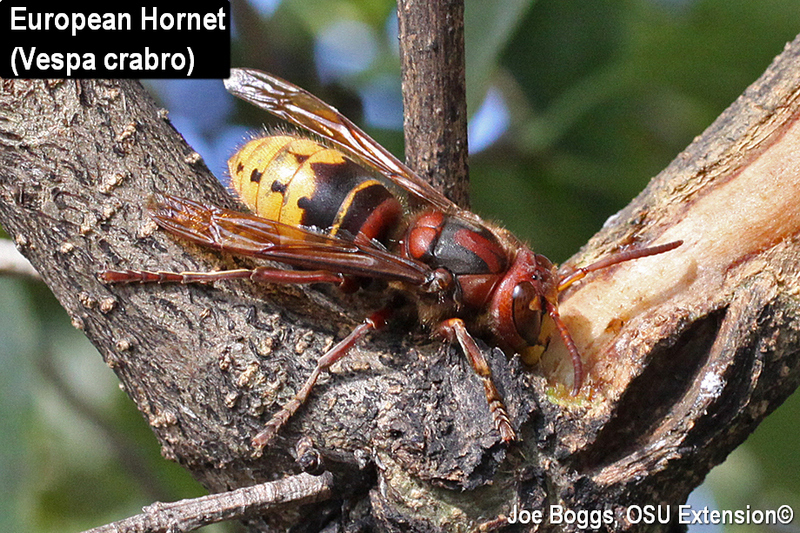 Technically, this non-native is the only "true hornet" found in Ohio. Taxonomically, our native bald-faced hornets (Dolichovespula maculata) are not hornets; they are grouped with yellowjackets which is why they are in the same genus as native Aerial Yellowjackets (D. arenaria). Unlike our native yellowjackets and wasps, European hornets can cause noticeable girdling damage to twigs and branches of trees and shrubs by stripping bark to the white wood. It is speculated that the hornets are extracting sugar from the phloem tissue. Although the damage may be noticeable, it's seldom significant enough to cause concern. European hornets construct paper nests that may look similar to the bald-faced hornet nests. However, they are most often found in hollow trees and sometimes in the walls of homes. Normally, European hornets overwinter just like our native bald-faced hornets, paper wasps, and yellowjackets with only the queens that are produced this season surviving the winter. The new queens leave the nests to seek protected overwintering sites; old nests are not re-used. However, occasionally the entire European hornet nest will survive the winter if they are sufficiently protected. Indeed, although it is rare, nests in Ohio have been observed surviving through three winters. European hornets are reputed to be highly aggressive and their large size does make them look pretty scary. However, during past encounters with this hornet, I was able to take close-up images and move branches with hornets on them without being stung or even charged. Still, landscapers should be cautious around these large stinging insects. Like wasps and yellowjackets, they are capable of stinging repeatedly. Unfortunately, there are numerous spurious web reports of giant Asian hornets swarming through multiple U.S. states. I do not believe these are intentional "fake news" reports; I believe most are cases of misidentifications or misunderstandings. For example, you can find several online reports of the Asian stingers being found in Jersey. That's not New Jersey but one of the Channel Islands, officially the Bailiwick of Jersey in the English Channel. It's easy to miss such nuances while scanning web headlines.